The Perfect Holiday Party just for us. 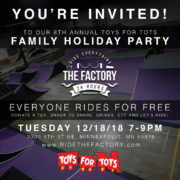 Next week Tuesday December 18th, join us at The Factory at 7pm! Bring a toy, snack to share, drinks, and get ready to mingle. It’s been another amazing year thanks to you, and we look forward to celebrating together.